I made this video months back after being in yoga classes (regular group mind you, NOT prenatal), and being dismayed that some instructors are not giving the pregnant ladies special attention (or modifications!). I wasn’t particularly worried for myself, as I was aware of what NOT to do, but a few times I had another preggo in the class and was definitely concerned for them. One time in particular, I wanted to walk over and say “Please, stop doing that!,” to a mom-to-be who was taking class as if she wasn’t carrying a 7+ month fetus. Problem viewing video? Click here to view on Youtube! That being said, mamas-to-be, please arm yourself with knowledge before jumping in a regular group class. Or, better yet, take a few prenatal classes to get going on the right track. Regardless, here are some clear NO, NOs from me to you. Ultimately, remember to listen to your body, and don’t push it (no, matter what anyone says). Take care of yourself and baby! Disclaimer: Always talk to your doctor before starting any exercise program. So, Oma came in the other day and gave me a break from the little one. Since no yoga studios seem to offer child care, the first thing I do when I am baby free is try and get in a class. My go-to is PURE, but seeing as I only had a limited time I decided to stay downtown (much to my chagrin PURE has yet to venture down to the best part of NY city). 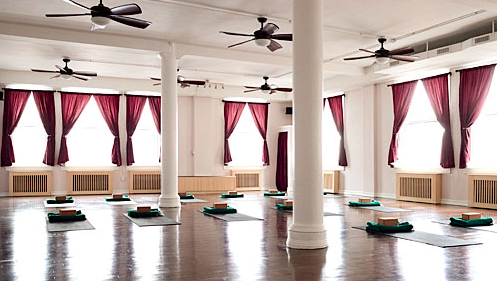 I had also purchased the Yoga Pass Book (one of the best deals in the city) and still had a slew of studios to check out before it expires at the end of the year. The class itself is taught by a teacher who is in or has just graduated from their teacher training, which I am all about having gone through it myself. I found the flow good and the studio space is great (spacious with lots of light and great floors). The only drawback is they are right on Broadway, so you do hear the occasion truck horn or subway rumbling down. Once the music was on it was all good, and the whole thing was totally worthwhile. So next time your looking for a low cost yoga session and a way to give back, check out Yoga Vida. They have two locations downtown (one on University and one on Broadway), and offer an array of classes (community classes typically are at 2pm). For more info head to www.yogavida.com. OM on!